Salt rooms, specially designed spaces in which salt therapy is delivered, replicate the benefits of naturally healing environments, such as natural salt caves or seacoast air. In salt rooms, visitors relax while breathing in air rich in aerosolized dry salt, which provides natural quality-of-life benefits for people of all ages. Salt rooms are a natural expansion for destination resorts, day spas, salons, massage centers and wellness centers, chiropractors, physicians’ clinics and other facilities that promote health. Also, people are adding salt rooms to their homes. In the United States and Canada, buyers choose Halomed because it features technology not available elsewhere: a feedback control system, in which the sensor signals the halogenerator to adjust output, when necessary. Salt room design can include salt-covered walls, special lighting, loose salt floors, comfortable furniture and other options. Children’s salt rooms can include play areas with toys and “salt” boxes, which provide very young salt room visitors with rich tactile experiences. Halogenerators for large salt rooms, such as the HaloSmart-01 or the HaloSpa-03, are mounted on a wall in either an adjacent technical room or in a vented cabinet on an exterior salt room wall. A hole is cut into the wall (and lined with a 4” PVC pipe) between where the halogenerator is mounted and the salt room. Aerosolized salt is delivered into the salt room via the halogenerator’s fan, which conveys the micronized salt and air through the PVC pipe and into the salt room. Ventilation helps disperse the aerosol throughout the room. In small salt rooms, 125 square feet or less, you can choose between the HaloSet System or the HaloCompact-01. These models for small rooms are positioned inside the salt room. Only Halomed's salt-room technology provides you with a measuring and adjustment system that assures consistent aerosol concentration. Why Are Dry Salt Aerosol Sensors Necessary? the actual rate of air circulation and other factors. Salt rooms vary in design. Some are very simple, while others feature special "salt cave" design, creating a unique atmosphere. Salt rooms may be outfitted with custom lighting, audio and video systems. Many salt rooms have children's furniture and play areas, including a saltbox, much like a typical sandbox, with plenty of toys to occupy young children. Blackboards, with plenty of colored chalk, give young visitors a chance to be creative. In salt rooms, weak currents of air, comfortable for visitors, pass through the room during sessions with a balanced ventilation system. Airflow ensures even distribution of aerosol throughout the room and compliance with local ventilation standards. Additional revenue through retail sales of related products, such as body scrubs, soaps and salt lamps. Halomed’s lightweight devices for small salt rooms (125 square feet or less) are ideal for people who would like to have a salt room in their home. Whether you plan to recreate all the ambience of a salt cave or do a simple conversion of a spare room, be assured that Halomed’s HaloSet system and the HaloCompact-01 produce the same benefits of Controlled Halotherapy as our larger units for full-size salt rooms. The learning begins, and Halomed North America is here to help you get started. Your first step will be to learn about salt therapy – what it is and isn’t – and how salt rooms operate. You’ll begin exploring designs, locations in which to possibly open a salt room and identifying financial resources. From this you will develop your business plan, which will become your guide to the numerous decisions and transactions throughout the planning, construction, launch and growth of your business. While business plans change during the implantation phase, they can become the foundation for operations and growth for up to the 3-5 years. Your business plan will include everything from consolidating and clarifying your ideas about the type of salt room business you envision to developing a budget for planning and building the salt room. Plus, you will need an operating financial model, which will help you understand how much revenue you will need for your business to be profitable. You will define your market – the geographic area, demographics and population density, and research other important market factors that will help you identify and plan outreach to your future customers. Technology is changing marketing by the day – yet you will want to have a good understanding of the marketing tools and their costs. Halomed NA can help you get started with some basic cost estimates and with understanding salt therapy as a business, yet each salt room owner’s plans are unique. Visit as many salt rooms as you can to see how different concepts create dramatically different results. Determine the location for your salt room. Nearly all salt rooms operate in leased commercial space. As you look, you’ll be evaluating the location’s proximity to your target market, travel conditions that affect access, such as traffic and its visibility from auto and pedestrian traffic. Be aware that local signage regulations can affect visibility. Ample parking, landscaping, exterior lighting and the overall appearance of the building and adjacent areas are important. Also, you’ll need to understand local regulations that govern occupancy and use. Then there are the interior factors, cost per square foot, available square footage for a reception area, retail area, salt room(s), other spaces for additional services, ability to have a small office or workspace adjacent to the salt room(s) so that you can easily access the operating panels on the devices, load them with salt and perform routine maintenance. 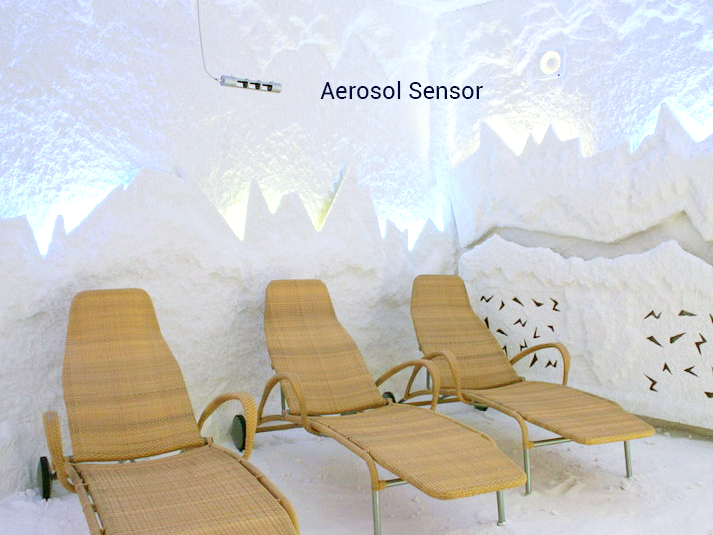 Capacity to isolate HVAC so that it flows one way – into the salt room and then exhausts to the outdoors is essential. Your HVAC engineer can help you plan how to accomplish this and learn about other options. It will also be necessary to install a passive air supply vent on the same wall as you mount your halogenerator, which will supply some fresh air from an adjacent area into the salt room, and a two-speed exhaust fan that vents to the outdoors. Ducts carrying exhausted air should be as short as possible (<15 ft.), made of corrosion-proof materials. In other matters, dropped ceilings will have to be sealed. An experienced Commercial Real Estate Agent can help you find a location and negotiate with the property manager, but you’ll also want to be an active participant in the search for the best possible location. Depending on your experience and the scope of the project, you may want to work with an architect who can also act as your general contractor, or who will coordinate planning and construction with a contractor. Your general contractor should secure the necessary local permits. Halomed NA will review your plans and advise on where to install the passive air vent, the halogenerator, the dry salt aerosol sensor and the exhaust fan. Develop architectural and construction plans. While you are searching for the right location you’ll also be outlining the design for your salt room and the rest of the business. Factor in the purchase price and delivery schedule for materials and supplies – including your Halomed equipment! A loose-salt floor will require a lowered floor or other interior architectural treatment to prevent salt from migrating out of the salt room. Design planning takes into account the overall look and purchase of construction materials and supplies for wall treatments (Himalayan boulders, bricks, salt coatings), reception desk, lighting systems and fixtures, furniture, retail fixtures, and perhaps media equipment. You will also plan modifications to the existing space and purchases for equipment to support ventilation, heating and air conditioning. After you developed a floor plan and placed an order for a Halomed system, we can now evaluate your floor plan and advice on where to position your halogenerator, sensor and exhaust fan and vent. Also, if there will be vents to provide heated or air-conditioned air into the salt room, we can advise on the best place to put these so that they don’t interfere with effective dispersion of dry salt aerosol. Remember, the best shape for a salt room is a rectangle. There can be exceptions to that, but interior architectural features that project too far out into the salt room can impede airflow, and it’s that airflow that carries micronized salt to your visitors. Without effective dispersion of dry salt aerosol, you cannot provide effective salt therapy. KEEP IN MIND that pre-construction involves securing the necessary permits, and with permits in hand, beginning any interior demolition and debris removal. When construction begins, you or your hired contractors will install the HVAC system, run electrical wiring, erect new walls, frame in doors, and install general and emergency lighting. Your salt room construction will include lighting, wall and ceiling finishing, installing the floor treatment and if part of the plan, installing wiring, outlets and fixtures for the installation of media, such as a large-screen television or sound system. With heavy construction out of the way, you can now install your halogenerator. Our handbook, “How to Make White Salt Coated Walls,” gives step-by-step instructions on how to apply white salt to walls. Halomed’s guidance will allow you to create beautiful white-salt coated walls that are non-toxic and free of harmful, volatile compounds, fireproof and non-combustible and resistant to mold and bacteria. Inquire about pricing. Our 95-page handbook, “Designing and Building a Salt Room with a Halomed Halogenerator,” outlines, step-by-step, the basics of salt room construction and development, with detailed information on HVAC solutions. The handbook details planning, construction processes, materials, and design options. Also, the range of lighting solutions, how-to's on fabricating decorative elements, and other guidance on the making of an attractive, appealing and efficient salt room are covered in this book that has been prepared exclusively for Halomed equipment customers. Inquire about pricing.